We never learn. Despite constant reminders. Despite everything. 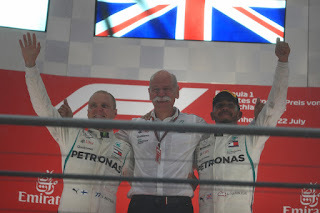 F1's mantras are familiar - that anything can and does happen; that it's not over until it's over; that no points are handed out until the chequered flag is waved. The trouble is we don't abide by them. Not even in this season which has contained more shifts - between and within weekends - than likely just about any other. 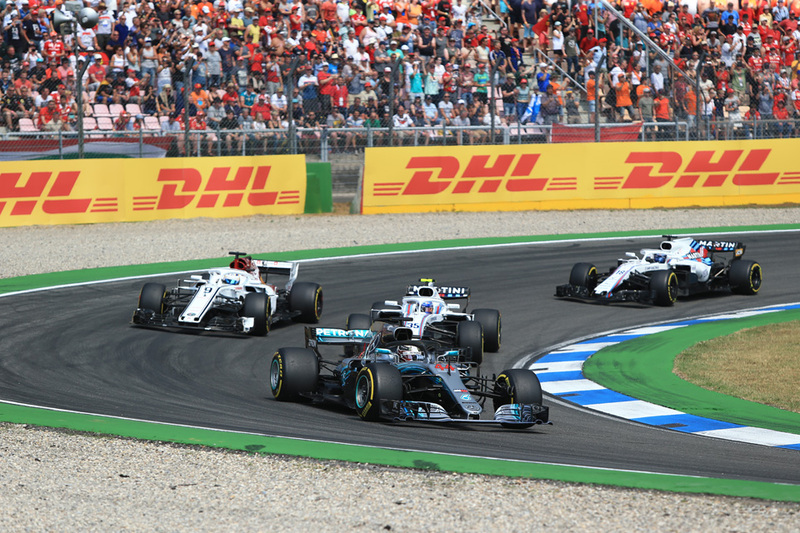 The German Grand Prix weekend at Hockenheim was but the latest reminder of the mantras' efficacy. And the sternest one. 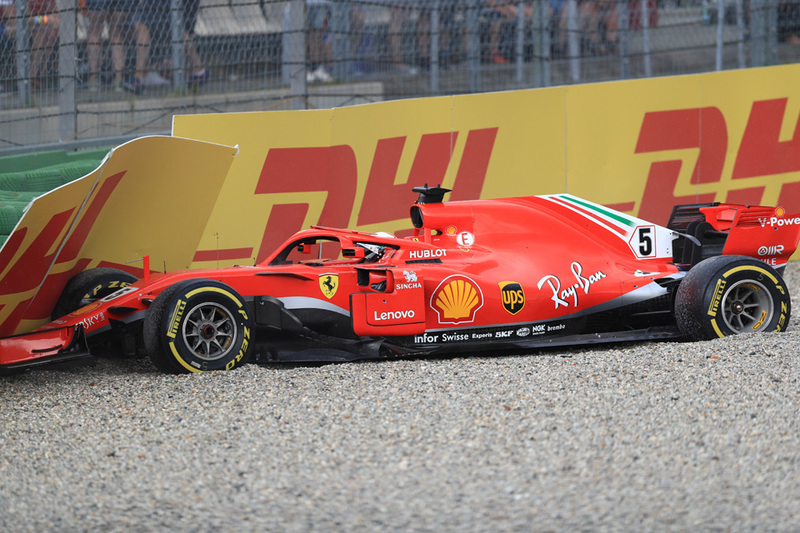 Sebastian Vettel took a crushing pole position in his Ferrari - Mercedes spoke of the Italian car having a half second advantage on the straights alone. And moreover Vettel's title foe Lewis Hamilton started 14th after a qualifying hydraulics failure on his Mercedes. Worse for him the suggestion floated that it was his error that caused the failure. Sure enough the arithmetic started about how much Vettel would extend his title lead by. But once the points were handed out things could hardly have looked more different. Vettel was in the wall and Hamilton, somehow, had come through to win. His title lead was not only reclaimed but healthy looking at 17. In a season of turns this was its sharpest. Vettel maintained first place from the off, yet the threat of something unusual happening lingered over the place. Almost literally so as it was in the shape of the weather. Rain it seemed permanently bubbled on the horizon - teams constantly warned their drivers in that typical way of it arriving for sure in a few minutes. Hamilton meanwhile as expected cleared the 'B Class' outside the top three teams fairly sharp-ish, indeed after the leaders had made their stops he got himself into third place close behind the leading Ferrari pair - during an odd interlude wherein Vettel spent several laps behind leader as early-stopper Kimi Raikkonen, complaining all the while on his radio of being held up and of his tyres overheating. 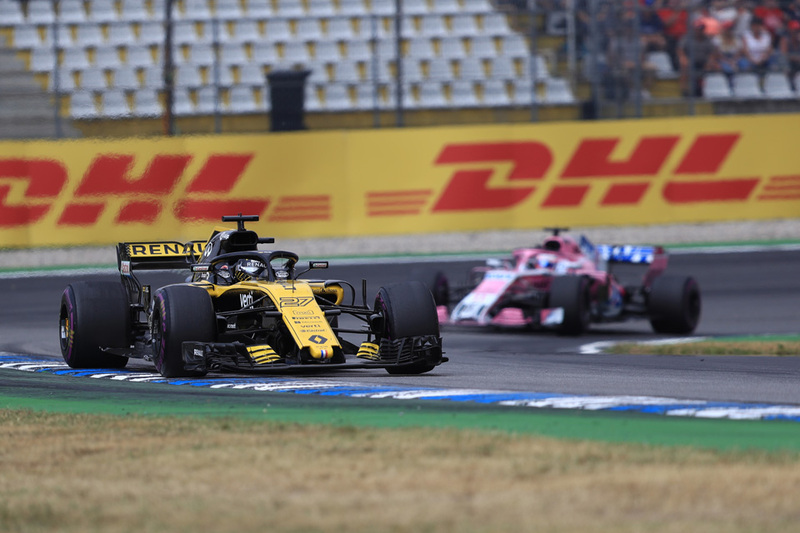 Hamilton had got there as he'd started on harder tyres and pressed on for an extended time without stopping, the aim apparently to kill two birds with one stone in his halt by taking on wet-weather tyres if the rain came. That would really get him into the mix. As it was Hamilton relented and made his stop but two laps before the first rain fell. As it was too though the rain helped tilt the win towards him. Just not in the way we thought. The first rain was light and only really over a single corner, then it relented though not before Max Verstappen who'd run in fourth throughout thought it was worth a gamble of taking on intermediates. He had to return for dries a few laps later - amazingly having only lost one place. To Hamilton. But no sooner had he done that than the rain came back, harder and wider spread this time and cars suddenly were skewing off in all directions. 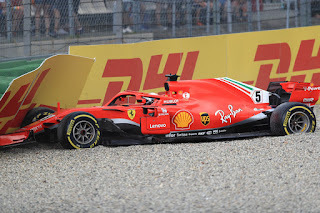 Including, astonishingly, the leader Vettel who almost apologetically nosed into the tyre wall after straight-lining the stadium section's hairpin. His day was done. His day, and everyone else's, in a blink looked unrecognisable. And more so than you might think. The safety car was called as a result of Vettel's prang and Valtteri Bottas and Raikkonen - now first and second - pitted. Hamilton stayed out and took up the lead. But even that wasn't quite as it seemed, as radio transmissions suggested that it owed to confusion (from Raikkonen not pitting first time by) rather than a strategic masterstroke and Hamilton in fact had been told to pit too. He indeed entered the pitlane then bailed out, taking a trip over the grass (something the stewards looked at post hoc, but only gave a reprimand for). Hamilton after qualifying and the race had spoken of his request for divine help - and it was indeed like some intelligent design had guided everything towards his victory. 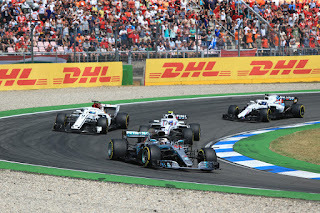 The Mercedes pitwall helped too, as when green flag racing resumed Bottas now in second attacked his team-mate hard and Hamilton defended about as hard. The call was quick - the Mercs had to hold position. Though Hamilton may have repelled the attack by then anyway. And suddenly it was over - Hamilton had a incredible victory having started 14th, by a way his lowest grid slot to win from in his F1 career. Underlining the extent that this one was unusual, from the entire expanse of F1 world championship history going back to 1950 he was only the 12th to win a race from that place or lower. About a one per cent occurrence, in other words. 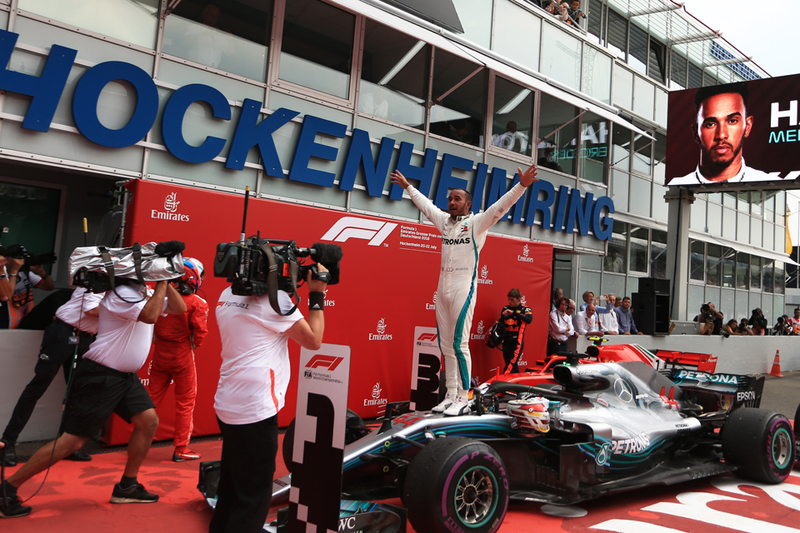 "It's obviously very, very difficult from that position and highly unlikely, but you've always got to believe," said an emotional Hamilton on this subject in his victory afterglow. "I would never have thought you could do something like that today, but I just kept pushing, I kept believing and it happened. I really manifested my dream today. "It was so tough out there and conditions were...perfect! When it rained I knew I would have a good position. "And I guess for those that don't know me - now you do." Vettel meanwhile was left to reflect that a small mistake can have big consequences. "I don't think it was a huge mistake, it was a huge impact on the race because we retired," he said. "It's disappointing because up to that point everything was sweet. We didn't need the rain." And Vettel took comfort from the bigger picture. "We have a strong car, so we can be as confident, more confident than anybody else," he added. "It was a very positive weekend, just one of those moments, and my mistake. Apologies to the team, they did everything right and I had it in my hands. Small mistake, big disappointment." Bottas followed Hamilton home, seemingly sanguine about the team call and that this was yet another win in 2018 to get away without him doing much wrong himself. Raikkonen was third and Verstappen after his adventures fourth. Nico Hulkenberg continued his fine recent form - and his fine record at this track - to claim best of the rest in fifth. He'd been headed by Kevin Magnussen's Haas in the B class for a lot of the way but jumped him in the wet running. Romain Grosjean in the other Haas followed Hulkenberg home in sixth having excelled in the late part and made up five places in the last 11 laps - after he (and Magnussen) was another to be impeded by an abortive switch to inters. The Force India pair were next home with Sergio Perez ahead - Checo had an eventful run which included a tardy pitstop, a spin in the worst of the weather as well as being passed by Grosjean on the final lap. Marcus Ericsson in the Sauber came through to finish ninth mainly via not being one to gamble on a switch to inters, and while Carlos Sainz was home 10th he had 10 seconds added for passing under the safety car. This meant the final point was taken by the surviving Brendon Hartley for Toro Rosso. F1 it seems takes its cues from Seinfeld: no hugging, no learning. Afterwards the talk despite everything was again familiar - was this a turning point in the championship? Perhaps, but half an hour earlier we were convinced it would be a turning point in the opposite direction. The previous round at Silverstone was purported to be that turning point too. And the previous one to that in Austria was almost like this one in reverse - we started the race thinking it was a shift to Merc and ended it thinking it was similarly pivotal in favour of Ferrari. This title story has had a few u-turns, and no doubt will contain a few more. We really need to start abiding by those mantras.